The carob evergreen tree is native to the Mediterranean where it has been cultivated for about 4000 years. The first carob seedlings were planted in California in 1873. Carob can be successfully grown in a climate that is conducive to citrus trees. After the pods are picked from the tree, they are dried, roasted and ground into powder. Once in powder form, carob can be made into carob chips or used in a variety of other ways. Roasted carob chips have nutty, earthy flavor. A carob chip tastes similar to, but not identical, to a chocolate chip. One thing you will immediately notice when you bite into a carob chip is that it is less bitter than chocolate. Carob is naturally sweet, therefore little or no sugar needs to be added to make them pleasing to the palate. Buying bulk carob chips is a budget-friendly way to incorporate this versatile chip into your health-conscious, weight loss or vegan diet. When you find carob chips for sale, stock up on them and use them just as you would chocolate chips. You simply use a one-to-one ratio when making the switch. While a carob chip and a chocolate chip are interchangeable in measurement, there is a distinct difference in their taste. When using the half and half measurement, you can reduce the amount of sugar you use. 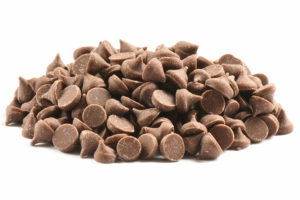 Carob chocolate chips can be a guilt-free treat for dieters. Carob chocolate chips can be added to granola, and trail mix recipes. They add a roasted cocoa-like flavor to baked goods, pancakes and cookies. These flavorful little chips can add a new dimension to your morning cereal or oatmeal. Knowing that there’s no caffeine in the chips means that you can enjoy them anytime, even as a late night snack. Carob supports heart health in a variety of ways. It helps reduce LDL (bad cholesterol) which can help reduce the risk of strokes, heart attacks and atherosclerosis. Carob also helps reduce blood pressure. Carob contains polyphenolic, an antioxidant that helps protect against cancer. Carob chips can be an acceptable part of a diabetic or weight loss diet due to protein and fiber they provide. Carob helps prevent spikes in blood sugar, making them a smart recipe ingredient or snack for diabetics. You may want to buy carob chips for the digestive benefits they provide. Carob is a rich source of dietary fiber. Fiber is essential to digestive health. The insoluble fiber in carob can help prevent or ease the symptoms of diarrhea. High fiber foods, such as carob chips, are beneficial to a weight loss plan. Carob is a good source of selenium. Selenium supports thyroid health and aids in the prevention of infections. Carob supports bone health and helps supports the nervous system. The vitamin E in carob helps keep your hair and skin looking vibrant and healthy. One characteristic that carob chips and chocolate chips share is their high fiber content. Carob chips offer a higher percentage of carbohydrates than chocolate chips. When you add either of these chips to your diet, you gain some beneficial vitamins. However, there is a difference in how much of your daily value you receive from each one. Carob contains a higher concentration of thiamin, riboflavin, niacin, vitaminB6 and folate. In addition to providing a higher percentage of various B vitamins, carob is also a good source of various minerals. Carob has approximately three times the amount of calcium in as cocoa. Both carob and chocolate are a good source of iron, magnesium, phosphorous, potassium, zinc, copper, manganese and selenium. Carob does not contain the flavanols found in chocolate. There is a notable difference in the level of stimulants in carob and chocolate. Chocolate contains caffeine and theobromine, which is another stimulant. When used in baking, carob chips have a texture similar to chocolate chips. Some people feel that carob chips lack the smooth, creamy texture and richness of chocolate chips, while other don’t seem to detect a noticeable difference in texture.